(i) The contrary position is taken as the argument's starting premise; that is, an infinitely old universe is temporarily assumed. (ii) It is then shown that such a premise leads to a logical contradiction, thereby, (iii) invalidating the starting premise. Let's look at the details. The starting premise is that the universe is infinite in time (or equivalently that it is infinitely old). And since all things must have a beginning we also assume that the universe along with time, of course, began in the infinite past. (If the reader rejects any, and all, notions of a beginning, rest assured, such a repudiation will be considered later.) ... Essentially the the premise is that the universe began infinitely long ago. But infinity is mercilessly uncompromising. Infinity is deceptively unattainable. If there was (or more properly if we imagine) a universe genesis in the ultimate remote past —infinitely long ago— then there is simply no way to arrive at the present, the present-and-very-real, Universe. No way for the "present" of the past to have traversed the infinite time-span between the alleged start-of-the-universe event and the physical present. The assumption that a genesis occurred in the infinite past leads to the absurd conclusion that the present —our here-and-now— cannot exist. It means, we can't get TO the present and yet here we are IN the present, thinking and discussing the infinity question (to pluralize a famous dictum, "We think therefore we are"). It means, the above step (iii) has been fulfilled —the starting premise has been invalidated. 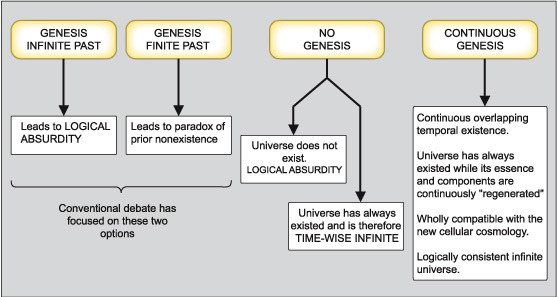 Logic demands that the time span from genesis (any sort of genesis) to the present must be finite! —no matter how great the time span! —no matter how far back we imagine genesis occurred! It simply cannot be otherwise. ... Logic is just as uncompromising as is infinity. And so, the premise must be wrong and must be rejected. Thus the universe did not begin in the infinite past. Now comes the tricky part. If the conclusion is that "the universe did not begin in the infinite past", can the conclusion be interpreted to mean that the universe had its beginning in the finite past? The conventional wisdom says that if the infinite past is ruled out then the universe must be of finite age. And the conventional wisdom of the philosophers has for a long time been backed by practicing astrophysicists. Moreover, the revolution in cosmology that spanned the 20th century practically demanded the adoption of this extended conclusion. Just look at the universe models constructed during that period. Some versions of the Big Bang have a singular beginning (called a singularity) said to have occurred roughly 15 Giga years ago. Other versions oscillate between epochal periods of explosive expansion and implosive contraction; and, presumably, were birthed from a mother-of-all big bangs. But, are philosopher-physicists truly justified in accepting the extended conclusion? ... Or have they missing something? Have they overlooked some other possibility? The problem is that the starting premise and its alternate are both wrong —both lead to paradoxes. The assumption that the universe actually had a beginning —whether in the infinite past or the finite past— is wrong. Entirely wrong. Kant also recognized this when he craftily advanced arguments that discredited both alternatives. On the one hand there is the problem of an unattainable infinite succession and on the other, if the universe came into existence at some particular moment in time, then there must have been a time before it existed (Kant called this "void time"). But then he argued, obscurely, that nothing can originate in a void time. Unfortunately, what weakens his argument is that Kant seems to believe that time has some sort of independent existence (a sort of absoluteness quality). In DSSU theory 'time' does not have independent existence; 'time' is simply an arbitrary and convenient concept for comparing motions, comparing increments of one motion with the increments of another. Motion is what determines existence, not time. Nevertheless, we will continue to use the term "time" with its everyday meaning. No. What the model makers of the past have overlooked is that there are four possible assumptions —four premises from which to attempt to construct a realistic universe. The chart below shows all the available options. How the universe came/comes into existence. There are 4 ways to configure a genesis for the universe. The conventional debate over the time-wise infinity of the universe has given rise to the first two options shown above. The 3rd option is the null configuration —a universe that neither came nor comes into existence. Inspired by (and compatible with) the new cellular cosmology, the last choice (on the right) involves a steady-state process of continuous genesis. The 4th option supports a logically consistent infinite universe. The first option, as we have seen, leads to a logical impossibility. The second option leads to its own absurdities: the obvious missing cause; the problem of prior nonexistence; the very meaning of nonexistence as applied to the universe. To assume that the universe had no genesis means that either (i) the universe is componentless and does not exist, or (ii) the universe and its components have always existed. The first obviously contradicts the evidence. The second fails to make a fundamental distinction between "the universe" and the components. If one selects the interpretation that the no-genesis universe has always existed, then it follows that such a universe is time-wise INFINITE. But, of course, then one is confronted with, and defeated by, Kant's famous argument. If we think of the 4 choices as methods for conceptually generating a generic universe then the 3rd selection represents the null option. ... The third option, we may immediately recognize, is quite contrary to the evidence on the one hand, and runs into the Kant argument on the other. See the adjacent textbox. The fourth option, to the best of my knowledge, has never been explored prior to the emergence of the Fifth Cosmology. The fourth option: Instead of postulating a genesis in the infinite past or postulating one in the finite past, this option hypothesizes a continuous genesis. What do I mean by "continuous genesis"? ... I mean that the universe is perpetually undergoing a process of continuous regeneration —an infinitely continuous genesis. I mean that the universe has a continuous overlapping existence. The Universe has ALWAYS existed while its essence and its components are continuously "regenerating." The Continuous-Genesis universe is compellingly natural. It is remarkably compatible with the observable cosmos. And this compatibility is not dependent on the philosophically incomprehensible hypothesis of an expanding universe. 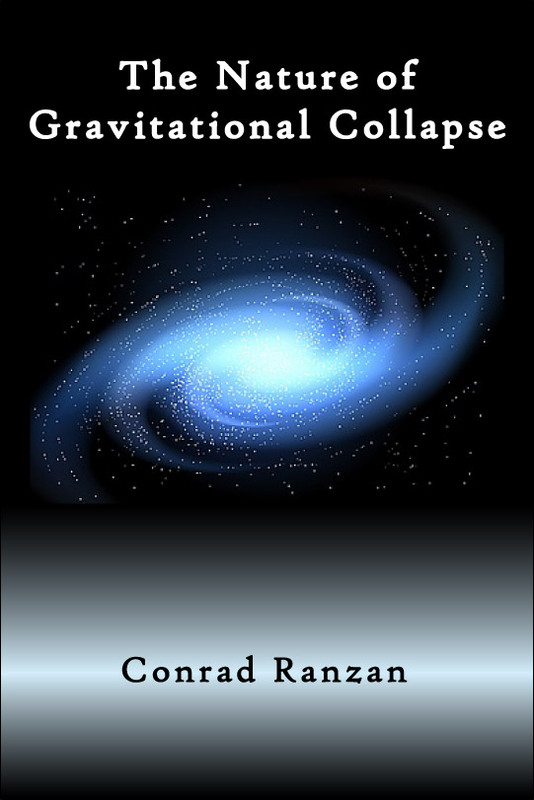 A speculative big bang scenario is not require for a perpetually regenerating universe. Best of all, and the main point of the discussion, is that the Continuous-Genesis universe is unambiguously temporally infinite. Now for the checkmate argument. First let me invoke DSSU theory and be quite specific as to the meaning of "regenerating": It means "the essence and components of the universe are continuously regenerating"; mass and energy particles, as well as aether units, are continually being replaced. I must emphasis that "regenerating" does not in any way imply a universe that is cyclical or in some way recycling itself. Rather, it is a one-way (one directional) process by which entities form or precipitate from the essence-substance of the universe. It involves the Primary Process of the Universe. 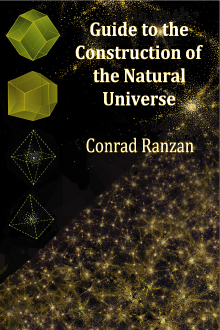 For more details on this, see the Physics Essays article, The Dynamic Steady State Universe. The "regenerating of the essence substance" means —and this is of fundamental importance— the growth or expansion of aether (an observable, detectable, phenomenon). And "regenerating of the components of the universe" means the spontaneous formation of the most-fundamental particles and their subsequent aggregation into hierarchical structures all the way up to galaxy clusters. 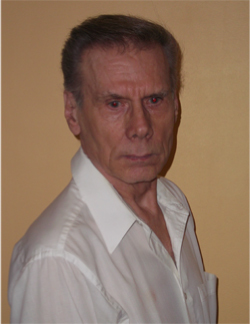 Now, in addition to the formation/creation processes there is another aspect to the notion of regenerating. There is the balancing negation of what has been formed/created. Do not think of this as being cyclical; the processes are continuous and simultaneous (although they occur in spatially separate regions). And rest assured there need be no violation of the conservation of energy law and no violation of the second law of thermodynamics. In other words, the Continuous-Creation universe is also a Continuous-Annihilation universe. ... But the paramount driver of the universe is the Primary Process. Essentially it is the Primary Process (missing in other models of the universe) that allows me to expand the claim attributed to the Continuous-Genesis universe and say that it is unambiguously and inevitably temporally infinite! The traditional argument, the one 'proving' that an infinitely old universe is impossible, only applies to a "simply created" universe. The argument does not apply to a "continuously created" universe. The New Cosmology model, the DSSU, is a continuous-formation universe. The formation processes are balanced by harmoniously opposite processes. There exists a perpetual harmony of opposites as was proposed by Heraclitus thousands of years ago. And whatever is perpetual is, by definition, infinite. The DSSU is time-wise infinite. Another important point is that the Continuous-Creation with Continuous-Annihilation universe involves oppositely dynamic processes. What happens when opposing steady-state dynamic processes interact? The answer represents the key to understanding the apparently phenomenological universe on its largest scale. The answer is, the opposing dynamic processes form cells —they form the cosmic cells of voids surrounded by galaxy clusters. They sustain the cosmic cells that have long been observed by astronomers but heretofore were unsupported by a compelling theory. Look again at the four options presented in the chart, above. For each option consider its opposing part or opposing process. (i) Genesis in the infinite past is opposed by an end-event in the infinite future. Now note that, obviously, there can never be any unity or synthesis between these conflicting opposites. (ii) Genesis in the finite past is opposed, presumably, by an end-event in the finite future. But these opposites can never be in true harmony (there can be no interactive harmony) because they occur separately and sequentially. (iii) The opposing part of the 3rd option is trivially sterile. A non-beginning is countered by a non-ending. (iv) With the final option, continuous creation is opposed by continuous annihilation. Here we have a dynamic unity of opposites. In fact, the fourth option embodies the ultimate harmony of opposites. The basic notion of the relationship between opposites can be traced back to the ancient Greeks. Aristotle (384-322 BCE) wrote of a vague unity of opposites, "the knowledge of opposites is one." Heraclitus of Ephesus (c.536-470 BCE) espoused a doctrine of "the harmony of opposites." It was a powerful principle and, through the ages, was adopted by other philosophers. One was Georg Hegel (1770-1831) who held that truth is an organic unity of opposed parts or processes. From this Hegelian perspective, the 4th option represents a dynamic unity of continuous formation/creation and opposing continuous destruction/annihilation. Hegel, as well as the philosopher Johann Gottlieb Fichte (1762-1814), embraced the strongest version of the harmony of opposites that I have ever encountered. The 4th option represents all reality, all existence, through a thesis, antithesis, and synthesis of its processes. The superiority of the 4th option is unquestionable. The 4th option in conjunction with the cellular-universe theory (DSSU theory) is a formidable cosmic imperative of crystalline clarity. ^ DSSU is the acronym for Dynamic Steady State Universe. It is a model based on the premise that all things are processes. The Dynamic Steady State Universe is a cosmology theory of a spatially infinite cellular universe. ^ Chronology of the five major cosmologies: The 1st cosmology was the universe ruled by Gods. The 2nd was the Geocentric universe ruled by Natural Laws. The 3rd was the Heliocentric universe. The 4th was the Expanding universe. Finally, the Fifth cosmology is the Non-Expanding Cellular universe.